Here’s a sample MIDI file for your enjoyment: Music maker test. You can find many of these functions in the ‘MusicMaker’ module. Converts a note string to a number. Returns an integer. Creates a chord based on note and chord type. root: This can be a note like the string “c4” or an integer. type: Type of chord. Please refer to the ‘ChordType’ enumeration. Creates a scale based on note and type. type: Type of scale. Please refer to the ‘ScaleType’ enumeration. Selects a random element from ‘myArray’ and returns it. myArray: is an array of stuff. strPattern: Provide a string to represent a pattern of sound. Each character represents a 16th note. x plays the note. – advances by a 16th note. All other characters are ignored. Class represents a chord played over a number of beats. length: number of beats to play chord. 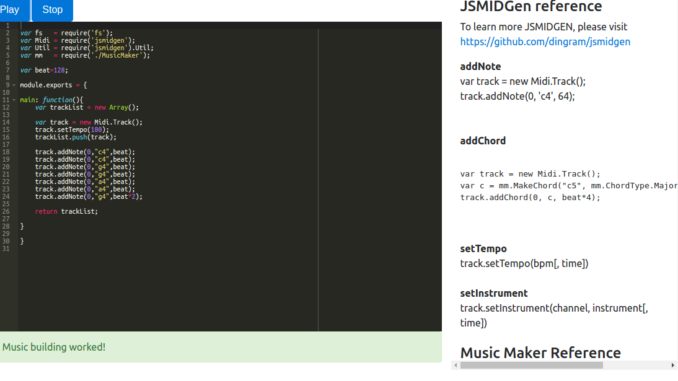 You can use chord player classes to generate music patterns based on a sequence of chords or chord progression. To use a chord player class, create an instance of the class and call the following: PlayFromChordChanges(track,chordList,channel). You need to pass a track, a list of chord changes, and a MIDI channel.